Thank you for your kind support, Tex Year finished the donation in November. We appreciate your continued support and encouragement to Tex Year. We would like to express our gratitude to you for helping us to complete the annual customer satisfaction survey and the activity of making a donation to the charity based on each effective questionnaire. With this activity, we has raised NT$15,300 through local customers, NT$7, 800 through overseas customers, and has made the donation to “Step30 International Ministries” in November. Tex Year hopes that we could keep sharing your caring with the public welfare actives in the future. Once again, thank you for your kind assistance. 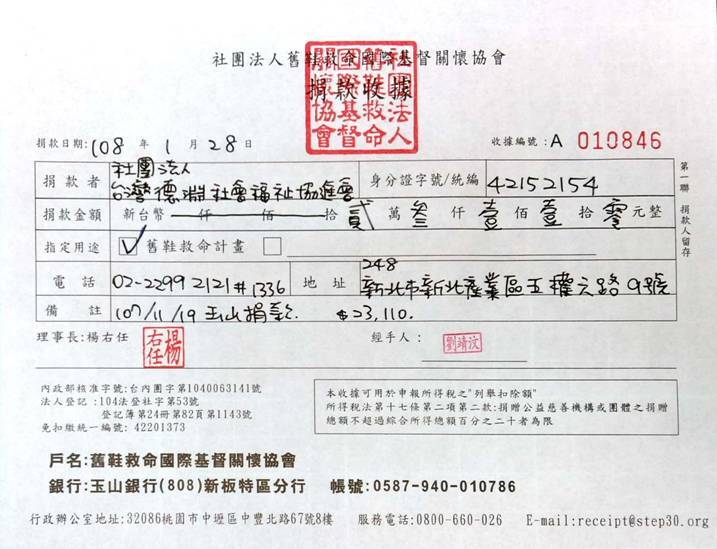 TEX YEAR Group Taiwan Taoyuan Factory have obtained SEDEX certification. Thank you for your kind support, Tex Year had finished the donation in November.